Rebels and skeptics often ask, "Why doesn't the New Order go gank the nullsec renters? They're the ones who use mining bots." Actually, we do gank them. We gank nullsec renters all the time--when they come to highsec and violate the Code. Clara Henkel was originally a highsec miner. 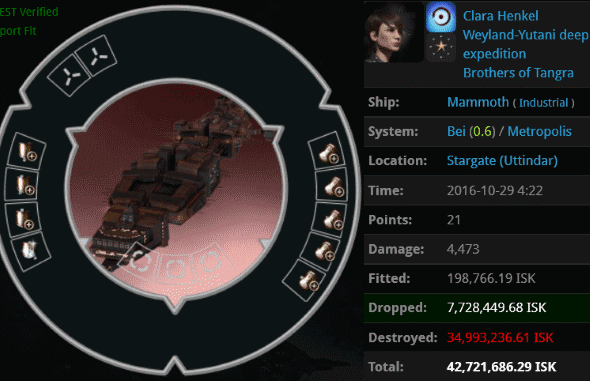 She decided to seek her fortune in nullsec by joining notorious renter alliance Brothers of Tangra. Still, she made use of highsec from time to time. She was caught hauling her ill-gotten goods by Agent Semtex Attor, who sent her a standard EVEmail telling her about the Code. Clara carefully considered this new information and penned a reply. The miner was skeptical about the relevance of the Code and its application to her life. Miner, calm down. Just make sure you get a permit before undocking in a new ship in James 315 space! If you want me to send you a permit, just transfer the Isk. Thank you in advance! When miners rely on their emotions, they tend to make poor decisions. Semtex tried to get Clara to focus by asking her to calm down. Come to think of it, maybe the standard form EVEmail sent to gank recipients should begin with "Miner, calm down." It appeared that the miner's attempt to calm down was unsuccessful. Watch your blood pressure! A permit will save the day though! Most people don't know it, but there are many scientific studies about the negative health effects of anger. Our Agents strive to improve miners in every way possible. Not all of us are technically doctors, but still. Clara reflected on the exchange she'd just had with Agent Semtex. She was sure that CCP would disapprove of Semtex's conduct. I hope you get a permit quick enough so you can fly safe in James 315 space and don't lose anything like this again: Kill: Clara Henkel (Mammoth). The miner allowed her passions to rule her. So far, it didn't look like a mining permit was in the cards. Was Clara a Goofus? Some careless words were spoken. Semtex quickly asked Clara to clarify that she only wanted him to die in-game. At this point, Agent Semtex determined that a more personal touch was needed. He invited her to join him on TeamSpeak to discuss the matter in a more relaxed environment. Sadly, Clara wasn't interested in maintaining a dialogue with Semtex, much less opening a new one with whatever Agents might've been on TeamSpeak at the moment. The miner stopped sending new EVEmails. One can only hope she stops violating the Code, too. Nasty little renter, this one; probably terminally unhappy, paying through the nose to eke out a living in someone else's space. What a sad life. It's a good thing Agent Semtex was able to point her in the right direction.